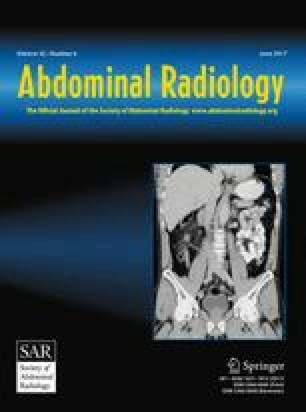 To develop a CT-based radiomics signature and assess its ability for preoperatively predicting the early recurrence (≤1 year) of hepatocellular carcinoma (HCC). A total of 215 HCC patients who underwent partial hepatectomy were enrolled in this retrospective study, and all the patients were followed up at least within 1 year. Radiomics features were extracted from arterial- and portal venous-phase CT images, and a radiomics signature was built by the least absolute shrinkage and selection operator (LASSO) logistic regression model. Preoperative clinical factors associated with early recurrence were evaluated. A radiomics signature, a clinical model, and a combined model were built, and the area under the curve (AUC) of operating characteristics (ROC) was used to explore their performance to discriminate early recurrence. Twenty-one radiomics features were chosen from 300 candidate features to build a radiomics signature that was significantly associated with early recurrence (P < 0.001), and they presented good performance in the discrimination of early recurrence alone with an AUC of 0.817 (95% CI: 0.758–0.866), sensitivity of 0.794, and specificity of 0.699. The AUCs of the clinical and combined models were 0.781 (95% CI: 0.719–0.834) and 0.836 (95% CI: 0.779–0.883), respectively, with the sensitivity being 0.784 and 0.824, and the specificity being 0.619 and 0.708, respectively. Adding a radiomics signature into conventional clinical variables can significantly improve the accuracy of the preoperative model in predicting early recurrence (P = 0.01). The radiomics signature was a significant predictor for early recurrence in HCC. Incorporating radiomics signature into conventional clinical factors performed better for preoperative estimation of early recurrence than with clinical variables alone. Ying Zhou and Lan He contributed equally to this work. The online version of this article (doi: 10.1007/s00261-017-1072-0) contains supplementary material, which is available to authorized users. We deeply appreciated the Medical Record Management Center for its close cooperation in data collection, sorting, verification, and database creation. This study was funded by the National Natural Scientific Foundation of China (Grant Numbers: 81271569, 81271654 and U1301258). All procedures performed in studies involving human participants were in accordance with the ethical standards of the institutional research committee and with the 1964 Helsinki declaration and its later amendments or comparable ethical standards. For this type of study, formal consent is not required. Statement of informed consent was not applicable since the article does not contain any patient data.